The Fullerton Museum Center in conjunction with Thinkspace are happy to present a small showcase featuring the works of the phenomenally influential Jeremy Fish. Fish, originally from Albany New York, moved to San Francisco in the 90’s to set up camp at the age of 19 in North Cali’s skate mecca, eventually studying screen-printing and painting, and completing a degree at the Art Institute of San Francisco. He went on to work commercially as an illustrator, designer, and art director, contributing to apparel companies and magazines like DLX, Think, Thrasher, Juxtapoz, and Slap. Inspired by children’s books and cartoons from the 70s and skateboard graphics from the 80s and 90s, Jeremy Fish’s world is both playful and dark, inhabited by animals, phenomenal graphic motifs, cool cars, and classic vans. He creates a whole cast of animal characters inspired by the cities and scenes he loves and the personal and human conflicts he observes. In 2015 Fish became San Francisco’s City Hall’s first-ever artist in residence, creating a body of work based on the iconic city he has called home since 1994. In celebration of its centennial, he created 100 pieces of mixed-media drawing based on San Francisco’s urban history and its civic hub, which were exhibited in a special project in the fall of 2015 entitled, O Glorious City. If that wasn’t enough, the city further showed their thanks for Fish by proclaiming November 19th to be “Jeremy Fish Day” from here on out. 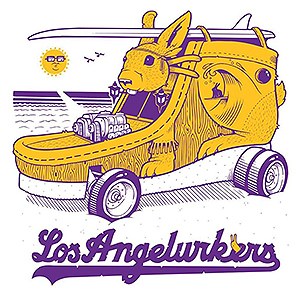 In this new body of work, The Los Angelurkers is a return to a more lighthearted Fish as he celebrates everything he loves about Los Angeles, in spite of his steadfast North Cali allegiances. In an attempt to cut out any unnecessary negativity from his life, following his recovery from a serious brain aneurysm in 2014, Fish has spent most of the past year hunting down this imaginative world of mythical creatures from the recesses of his ingeniously offbeat mind, revealing a cool and playful world of fantasy and nostalgia.